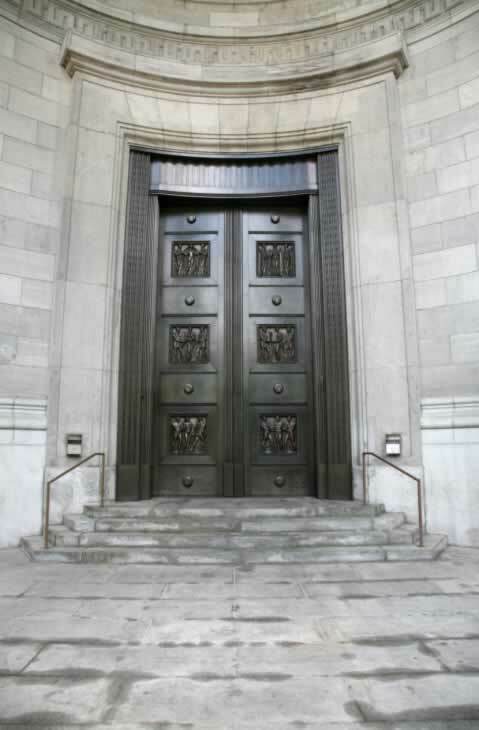 These enormous double doors are in the same style of ancient doors that have been dated as far back as 2000 B.C. Despite the fact that these two doors appear in a concave wall, the doors themselves are not at all curved. These doors have been framed into three panels, with a top rail, a bottom rail, and two intermediate rails and then sheathed in bronze. The doors' outer or vertical board, also known as a stile, is the hanging style. Instead of hinges, these doors are hung by pivots at the tops and bottoms of the hanging stiles, which were placed into the door's lintel (top) and sill (bottom). Each of the rails is decorated with a simple bronze half-sphere, or rosette. The three panels in both doors have been sculpted to portray a unique scene of three men. No knobs or levers are required as these doors are pushed open and pushed closed.